Last Friday sermon touched upon early accounts of Qadian when it was a small, unknown place. When the Promised Messiah (on whom be peace) went for walks he would be accompanied by just the odd person and they walked on pathways alongside bushes. Qadian has progressed greatly since then, progress which was foretold by God. Usually places that are located close to highways develop but Qadian was situated in a corner and could not even be accessed via road and now people visit from far and wide. Hazrat Musleh Maud (may Allah be pleased with him) explained this progress as a tremendous sign of the Promised Messiah (on whom be peace). He recounted the original size of Masjid Mubarak in the times of the Promised Messiah where perhaps only two rows of worshippers could be accommodated and he compared it to its extension in his time. He encouraged people to visit the mosque and imagine how Ahmadis had been astonished when the small mosque which could only accommodate two rows of around five worshipers per row had a third row and around fifteen worshippers. Hazrat Musleh Maud (may Allah be pleased with him) also recalled how as a child he had to climb stairs next to the house of Mirza Sultan Ahmad Sahib to go on his roof top to play. The family had not yet accepted Ahmadiyyat and his aunt would always mock him in the vernacular. As his mother was Urdu-speaking he did not understand Punjabi very well at the time, so he asked his mother what was the meaning of the aunt’s remark. It was a derogatory remark meaning ‘like father like son’ drawing analogy with crows. Then a time came when after accepting Ahmadiyyat the very same aunt would show extreme reverence to Hazrat Musleh Maud (may Allah be pleased with him). Based on a dream the Promised Messiah (on whom be peace) predicted that Qadian would grow and develop so much that it would reach the banks of River Beas. Hazrat Musleh Maud (may Allah be pleased with him) draws our attention to observance of Salat with reference to growth of Qadian. The Promised Messiah had a dream that Qadian had spread to the banks of Beas and Hazrat Musleh Maud deduces from this that the population of Qadian would be around a million which means that a mosque to accommodate 400,000 worshippers would be needed. He says that Masjid Aqsa of Qadian would be extended to accommodate the worshippers for Friday Prayers. Indeed, Masjid Aqsa has been extended and developed as much as it could be bearing in mind that other old and historic dwellings around it had also to be preserved. It is of course possible that as the population of Qadian increases a large mosque would have to be built there. Hazrat Musleh Maud (may Allah be pleased with him) narrates an incidence from his adolescence days. As he walked for Friday Prayers he saw a person walking back from the mosque. On inquiring the person told him that the mosque was packed and had no more room. So Hazrat Musleh Maud also walked back home where he offered his Zuhr Salat. With the benefit of hindsight he felt he should have at least checked for himself if there really was no space in the mosque. With the grace of God he was regular at offering Salat from a very young age and never missed any Salat. His blessed father did not have to ask him if he had offered his Salat or not. When he was eleven years old, he donned his blessed father’s coat and prayed fervently and passionately pledging never to miss his Salat. However, since he was quite young at times he did not offer Salat in congregation. Someone complained to the Promised Messiah (on whom be peace) about this. The Promised Messiah gave the example of another young man whose father checked on his Salat strictly and said the young man offered his father’s Salat and he did not want his son to offer Salat for him but wanted him to offer it for God. Children should not deduce from this account that parents do not have to supervise their Salat or parents should not deduce that it is not their responsibility to supervise their children’s Salat. Indeed, the Promised Messiah (on whom be peace) had great faith in Hazrat Musleh Maud (may Allah be pleased with him) and he was also aware that he was going to grow up to be the manifestation of Musleh Maud (Promised Reformer) and he also knew that God Himself was going to reform him. Besides, the fact that he had prayed in a most heart-rending way to be regular in Salat at the tender age of eleven is a testimony to his sincerity. However, he narrates that at the time he had turned back from going to the mosque for Friday Prayers it was God’s will to remove his indolence. The Promised Messiah (on whom be peace) asked him if he had not gone to the mosque for his Prayers. He replied he had but he found out that the mosque was packed and had no space. Privately he was scared and wondered why he had not checked for himself if the mosque was actually packed. Meanwhile Maulawi Abdul Karim Sahib returned from the mosque to ask after the Promised Messiah’s (on whom be peace) health who was not well and that is why had not gone to mosque. The Promised Messiah asked Maulawi Abdul Karim Sahib if the mosque had been packed at Friday Prayers. He replied that with the grace of God it was and there was no room to move. Full mosques are made a source of our progress by God. Expansion of Qadian and expansion of our Jama’at is not going to be in context of space and numbers and will be in context of our filled homes and filled mosques. When we talk about building mosques we should forge sincere connection with God so that God does not leave us and we can experience the fulfilment of every prophecy of the Promised Messiah (on whom be peace) with glory. Hazrat Musleh Maud (may Allah be pleased with him) said God told the Promised Messiah (on whom be peace) that Qadian would grow as large as Bombay and Calcutta and will reach the banks of River Baes which flows some nine miles away. Of course this was when inhabitants of Qadian numbered only two thousand and most houses were of unbaked bricks and one could not even purchase a basic commodity like flour in more than small quantities. People milled their own flour at homes, there was a small primary madrassa and the post was delivered once a week. Such a situation was not conducive to the fulfilment of the grand prophecy. The railway line was at a distance, there was no industry to facilitate development and there was no governmental office and no police station. Indeed, there was no market place. The Promised Messiah (on whom be peace) had only a few hundred followers scattered around the country. Reflecting over the prophecy in light of the how Qadian has developed today, though it has not reached the banks of Beas, anyone would call it a sign. These matters are faith-enhancing for Ahmadis but they also interest others. A professor from here who is an expert on Islam went to Qadian for the purpose of research. His impressions and comments are amazing and will be published. Hazrat Musleh Maud said that it is not a given that the Promised Messiah (on whom be peace) was shown the entire extent of Qadian’s development in his dream. Indeed, it is entirely possible that Qadian grows so much that the River Beas becomes a stream that flows through it and Qadian spreads far beyond it. As Qadian is developing with new buildings people of Qadian are also building homes as are Ahmadis from other parts of India and indeed from around the world. However, the fundamental aspect is that the secret of every success is to fill houses of God. This fact is also associated with the general success and progress of the Jama’at. We should always remember that God has promised not just progress of Qadian but of the entire Jama’at. Some people are perturbed at times and then figure out themselves that such and such matter will be fulfilled through such and such prophecy. News came from Pakistan today that in the name of containing sectarianism the government has banned certain publications. Al Fazl and Ruhani Khaza’ain are included in this ban although they have nothing remotely to do with sectarianism. Indeed these people have not even bothered to open these publications and read that they are written in defence of Islam. No matter what the situation we should not despair. God has stated many a time that help will come suddenly for the Promised Messiah (on whom be peace). Hazrat Musleh Maud (may Allah be pleased with him) said one could not conjecture when that help would come. One can think and ponder at Tahajjud and at Fajr how many problems one faces and then the sun will rise and help will come! Explaining a question regarding putting flowers on graves Hazrat Khalifatul Masih V said it is an absurd and idle practice, an innovation with no basis in religion of Islam. Some people used to place flowers on the tomb of the Promised Messiah (on whom be peace) so it is now fenced off. Hazrat Musleh Maud (may Allah be pleased with him) called the practices of taking earth/soil from a grave as a blessing and placing flowers on graves idle and absurd because they are of no benefit to the deceased. That said, the departed soul has an affinity with its burial place. Indeed, once the Promised Messiah (on whom be peace) went to pray at the grave of some saint. He said that as he prayed he saw the deceased saint sitting before him. This does not signify that his soul came out of the earthen grave. Owing to the connection the Promised Messiah had with the saint God allowed his spirit to be visible to him. It was the indeed the same kind of grave about which the Qur’an states: ‘Then He causes him to die and assigns a grave to him:’ (80:22) A deceased person’s soul has an affinity with its burial place but placing flowers on graves has no significance. It is related that when the Promised Messiah (on whom be peace) asked the elderly in the area how the saint looked like they described the exact appearance which the Promised Messiah had seen. Of course prayers should be said on gravesides because they are beneficial to the deceased in terms of reward and punishment and one should pray for spiritual rewards for the deceased but no kind of shirk (associating partners with God) should be practiced. This account relates to the Promised Messiah’s (on whom be peace) masterpiece writing ‘The Philosophy of the Teachings of Islam.’ In 1897 when an interfaith convention was planned in Lahore Khawaja Sahib [who later left Ahmadiyya Jama’at] brought a message to the Promised Messiah (on whom be peace) to write an exposition. The Promised Messiah was not very well in those days, but he still started writing the exposition and finished it. Khawaja Sahib was not happy with the exposition and expressed a sense of hopelessness and felt it would be mocked and derided. God had already informed the Promised Messiah (on whom be peace) that his exposition would excel so he had some posters published about the exposition and assured Khawaja Sahib about it and asked him to put up the posters in Lahore. Khawaja Sahib had made his mind up about the exposition so he withheld putting up the posters and only did so at the very end when others insisted. He put up a few posters high up on walls the night before so that no one could see them because he thought the exposition was not worthy to be read at the convention. However, when the exposition was read out at the convention, as we know, the audience were entranced. The appointed time for the exposition passed but the audience remained ever eager. The time was extended, so much so that in order to accommodate the exposition the convention had to be extended by a day. Friends and foes alike extolled the exposition, and God’s word was fulfilled but the weakness of Khawaja Sahib’s faith kept it hidden. Khawaja Sahib was an educated man, he was a lawyer but arrogance can make a person lose his senses. The exposition continues to impress and move people to this day on academic level and many people accept Ahmadiyyat after reading it. Commenting on sense of honour for faith Hazrat Musleh Maud (may Allah be pleased with him) said why would one go to a place where abusive language is used for Jama’at and its elders. If an Ahmadi goes to such places it shows they lack sense of honour for faith. Why would one go to a place where one expects one’s parents will be abused! If one does, it shows that one has a very low sense of honour. In the times of the Promised Messiah (on whom be peace) the Aryas held a convention in Lahore and invited him to write an article to be read at the convention. The Promised Messiah (on whom be peace) said he knew there would be abuse at the convention and declined to take part. Some people insisted that he should take part so in spite of feeling disgust the Promised Messiah (on whom be peace) wrote an article and sent Hazrat Maulana Nur ud Din (may Allah be pleased with him) to read it. Hazrat Musleh Maud also went along. The article was based on a message of love and harmony. When the Arya speaker read his piece it had abusive language towards the Holy Prophet (peace and blessings of Allah be on him). Hazrat Musleh Maud got up to leave. Others said Hazrat Maulawi Sahib was still seated. He wanted to leave but on the advice of others he stayed. Something he lived to regret. When the Promised Messiah (on whom be peace) came to know of the situation he was most displeased as to why they had not left. Sometimes there is nothing wrong in publishing such abusive narratives so that they can be part of corroboration of the community. But sitting in such gatherings is honouring them and members of our Jama’ats should not do so! In last Friday sermon Huzoor related an account in which he mentioned the Promised Messiah (on whom be peace) suffered from a bout of cough but he still ate a banana which is not very good for cough because God had informed him that his cough had been cured. Someone wrote in to Huzoor and said that the account in fact said that the Promised Messiah (on whom be peace) had actually eaten an apple and not banana. Huzoor explained both apple and banana are mentioned in accounts. The Promised Messiah (on whom be peace) ate a sour apple although he had been suffering from cough. The main issue was that the revelation was fulfilled. 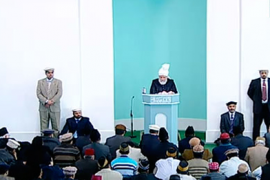 Huzoor said he was explaining this so that others do not also write in with references. He said he had both the accounts mentioning apple and banana but had only read one of them last week. Funeral Prayer in absentia was announced for dervish of Qadian Haji Manzoor Ahmad Sahib who passed away at the age of 85 on 1 May.